Chris Ringham took 2-13 for March at Burwell. March Town delivered their best performance of the Cambs Division One season to give themselves an outside chance of avoiding relegation. The Crows beat Burwell seconds by 182 runs yesterday (September 5) and are just nine points Saffron Walden seconds heading into the final weekend of the season. March have a winnable game at Waresley (September 12), but Saffron Walden, who lost a low-scoring game at Ketton yesterday, will fancy their chances of winning at home to Burwell. Certainly March softened Burwell up yesterday as they won for just the third time this season. Kiwi Ash Vodnala has performed solidly in a struggling side and contributed another 81 against Burwell, before skipper Jody Betts (53 not out from 49 balls) hurried things up towards the end of his side’s 261-6. Vodnala completed a fine all-round day with 4-15, while medium pacers Tyler Phillips (3-27) and Chris Ringham (2-15) also bowled well as Burwell were shot out for a paltry 79. Ketton did March a favour by successfully defending a modest score of 140 at Pit Lane. Professional Rob Woolley (76) proved a class apart on a tricky track and his efforts were well backed up by bowlers Shakaar Mahmood (4-12), Will Compton (2-3), Matt Milner (2-28) and Ulrich Van Duyker (2-45) as Walden were dismissed for 106. Woolley is now the top run scorer in Division One with 791 at an average of 46. Ketton are fifth in their first season of top-flight cricket, one point behind Nassington who they host on the final day of the season. Nassington beat relegated Warboys by 76 runs yesterday thanks to a half century from Tom Norman and 5-42 from teenage spinner Harrison Craig. Craig needs two more wickets for 50 in the season, a total passed so far by only Van Duyker (55) and Wisbech skipper Gary Freear (50). Freear claimed 3-30 at Histon yesterday, but it wasn’t enough to stave off a two-wicket defeat. That result and Godmanchester’s 13-run win over Ramsey secured the title for Godmanchester who have not lost a match all season. Freear also top scored with 69 as Wisbech made a less than adequate 170-9. Ramsey threatened Godmanchester’s 184-9 until Aussie Dean Jones was dismissed for 79. Jones (4-23) also bowled well for the deposed champions as did fellow countryman Joe Barningham (3-56). Khalsa’s great escape from relegation from Division Two continued with a four-wicket win at promotion-chasing St Ives. It was a fourth win in a row for the city side as Mannivair Singh (48) top scored in pursuit of the home side’s 184-6. Khalsa complete their season at local rivals Newborough where a win will seal their safety, but they will need to beware Aussie batsman Robbie Trickett. 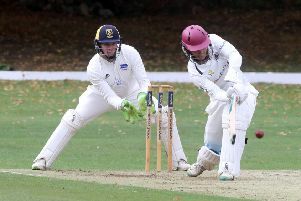 Trickett cracked 124 in Newborough’s drawn game with relegated Cambridge NCI yesterday to take his tally for the season to 791 - useful for a man being paid £1 per run. Burwell 79 (A. Vodnala 4-15, T. Phillips 3-27, C. Ringham 2-13). Godmanchester 184-9 (T. Aziz 47, D. Jones 4-23, J. Barningham 3-56). Ramsey 171 (D. Jones 79, T. West 25, B. Moynan 3-16). Wisbech 170-9 (G. Freear 69, J. Bowers 38, P. Edgeller 28). Histon 171-8 (G. Freear 3-30, J. Williams 2-35). Ketton 145 (R. Woolley 76). Saffron Walden 106 (S. Mahmood 4-12, W. Compton 2-3, M. Milner 2-28, U. Van Duyker 2-45). Nassington 209-7 (T. Norman 50, G. Scotcher 31, A. Ali 26, J. Pope 21, R. Duffy 20, L. Gaynor 3-48, A. Morris 2-24, J. Trafford 2-26). Warboys 133 ((L. Gaynor 61, A. Pedlar 25, H. Craig 5-42, D. Bandaranaike 3-42). Khalsa 187-6 (M. Singh 48). Cambridge NCI 160-7 (A. Gilbert 3-27).